In looking this over, I’m struck by the reliance on fractionated parts of whole foods; things that are difficult, if not impossible, to produce on a homestead scale. This may be a scientifically-validated optimal blend, but chickens do not absolutely need this; you can bet that our peasant homesteader ancestors did not have access to purified wheat bran, vitamins, or soybean meal, and their chickens seem to have done fine. So I’m going to treat this recipe as a scientific ideal, and see if I can instead find a recipe comprised mainly of whole foods. The next information I found was in a Heifer International publication. This includes a lot of detail about individual feed components (e.g. wheat is higher in protein than other grains, but is deficient in lysine; soybeans must be heated or sprouted prior to feeding, to destroy a tripsin inhibitor that they contain; sprouting increases the protein and vitamin availability of grains) and suggests sources for farm-scale mills and roasters. It also includes a spreadsheet for developing your own feed mixture, listing the composition of individual feed ingredients in terms of their protein, fat, fiber, several vitamins and minerals, and four key amino acids (lysine, methionine, cystine, and arginine). This is a fantastic resource, but a bit overwhelming. 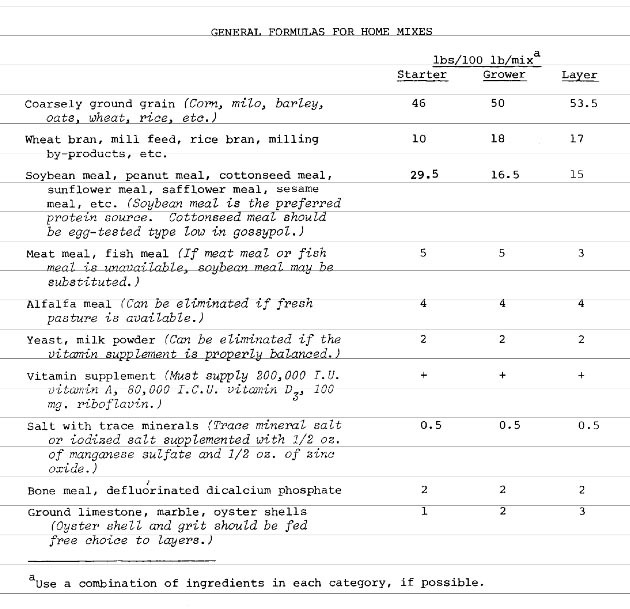 Fortunately, Harvey Ussery‘s book has some reassuring words: he believes that if you use diverse, whole, fresh feedstocks, and balance for protein content, the other nutrients will tend to be present in appropriate percentages. However, he does recommend including several supplements in your mix, things that most likely will have to be purchased, rather than grown at home: mineral supplements, kelp meal, cultured dried yeast, and other materials. He says that these are less critical if the birds have access to good pasture, though. So I made my own simple spreadsheet to see what a home-grown mix might look like for us. 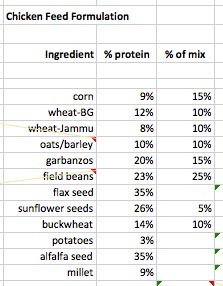 I looked up the protein content of the crops that we grow, using average or best-guess values for some of them (some of the values were difficult to determine; for example, the % protein for hulled oats is listed as lower than that of hulless oats, but it is not clear to me whether the weight of the hull is included in that percent). Then I played around with different mixes, trying to make one that would make most use of the crops that we have in abundance and also lead to the correct protein content. Laying hens, which is what our flock consists of the majority of the time, need 15-18% protein in their diet (chicks need more, 20-22%, and pullets need less, 14-16%). I was also careful to pay attention to recommended limits on certain feed items. Wheat, for example, is recommended to be fed at no greater than 30% of the diet, unless sprouted. Oats and barley should be kept below 15% to avoid digestive issues. All beans and peas contain some levels of the trypsin inhibitors mentioned above, although not as much as soybeans have. These inhibitors interfere with protein utilization in the birds, but roasting or soaking/sprouting the legumes prior to feeding will destroy the inhibitors’ power. According to Ussery, the inhibitors may also be destroyed during the time spent in the chicken’s crop, so this may not be so much of an issue if not using soybeans. This mix provides just under 16% protein, which is on the low end of the chickens’ requirements. I’m okay with that, since (a) I intend to sprout most of the components before feeding, which makes the nutrients – including the protein – more bioavailable, and (b) they have access to pasture, which means that worms, spiders, and insects will help boost their total protein intake. I included flax, alfalfa seed, potatoes and millet in the spreadsheet as potential ingredients, although we don’t have any of them in storage currently. The flax, in particular, is quite appealing not only because of the high protein content but also because it has a high concentration of omega-3 fatty acids (for a land plant source). The millet, although low in protein, is a much-loved special treat for our birds; they eat it so enthusiastically that sometimes it goes up their noses and they start sneezing. As for potatoes, I’m not sure quite how they fit into the diet, but we grow lots of them, so they may come in use. I currently supplement store-bought feed with all of the ingredients that comprise my new mix; however, I have not calculated the percent makup of the mix I use. Rather, I just throw some coarsly-ground corn out for them, and also several handfuls of a sprouted mixture of all of the other ingredients. I’ll move into a more balanced mix in the upcoming months, trying to substitute this mix for the purchased feed in increasing proportions, and keeping alert for any negative health impacts that may arise if my feed balance is off. Mixture of wheat, oats, spelt, sunflower seeds, buckwheat, peas, and flax seeds, ready for soaking and sprouting. 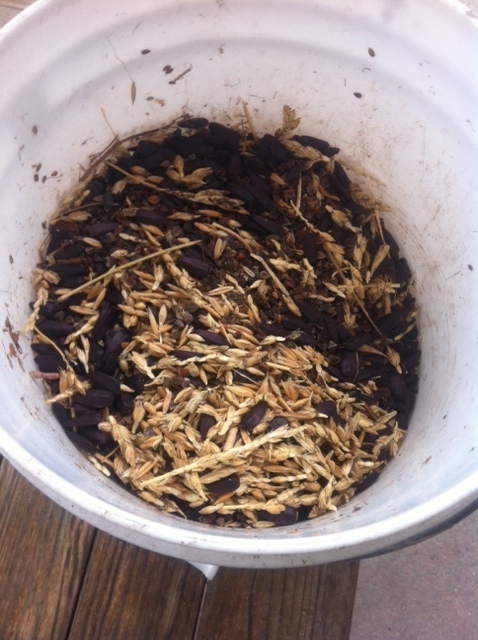 This entry was posted in chickens and tagged chickens, home-grown feed, pasture-raised, protein. Bookmark the permalink.